Gordon McIntosh was a Labor Party Senator in the Australian Parliament from 1974-1987. During those years he played a major role in keeping the Timor issue alive in the Parliament, despite the actions and policies of successive Australian Governments (Labor and Liberal) to oppose East Timorese self-determination and independence. In addition to the many parliamentary questions asked by Senator McIntosh, he is best known as Chair of the 1982-83 Senate Inquiry about East Timor and his membership of the Australian parliamentary delegation to Indonesia and East Timor in 1983. His dissent from the formal report of the delegation was widely reported in Australia and welcomed by the Resistance in Timor. Outside the parliament he addressed public meetings in Australia, New Zealand and New York. He petitioned the United Nations Decolonisation Committee in 1982 and joined others on the Lusitania Express peace ship mission to Timor in 1992. In 2014, Gordon McIntosh was awarded the Order of Timor-Leste for his contribution to the East Timorese struggle for independence. In 2016 he visited Timor-Leste as a guest of the State. During this visit he met for the first time the resistance veterans who had applauded his support in the 1980s. 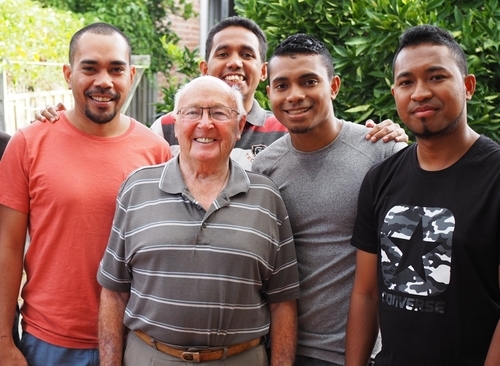 Now in his early 90s, Gordon McIntosh continues to closely follow developments in independent Timor-Leste.